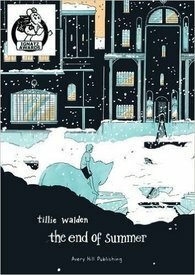 The End of Summer is wunderkind Tillie Walden's graphic novel debut. Published by the UK's Avery Hill Publishing, it was started (and finished?) while Ms. Walden was still a student at the Center for Cartoon Studies, and has been turning heads with its polished professional poise, despite its creator's tender years. Born in 1996, Ms. Walden was the top Ignatz award-winner at this past year's SPX. Get a taste of what she's (been) up to at tilliewalden.com. You're sure to be impressed. Your reaction to The End of Summer is likely to be more along the lines of amazement.